Stairs can be hard on many people’s bodies, not just those older in age. Some people have hip or knee problems and climbing up or down stairs can increase discomfort or be extremely painful. Not being able to use the stairs in your own home can definitely play a toll on your mental health. Whether you’re aging and your body isn’t working the way it used to, or you have an injury/illness that keeps you from being mobile enough to use your stairs, there are things that can help. Although homecare services are available, there’s no greater freedom than being able to use your own stairs with the availability of home mobility stair-lifts. It may seem small, but stairlifts definitely play a big part in keeping your independence. Being able to move around your house is important to the quality of life you get to live. And there are stairlifts to fit any stairway. There are straight, curved, outdoor and reconditioned stairlifts. Straight stairlifts are fairly straight forward, but curved ones are a little more complicated. A curved staircase will need to be per-individual. The staircase would be assessed and a price and plan would be made. I wouldn’t worry too much if you have a curved staircase though, they are really common, stairlift companies have to deal with them a lot. Outdoor lifts will allow you to get up and down your porch steps, garage or deck to give you access to your backyard if required. This makes it so easy for you to enjoy more time outdoors. It will be as if your hip or knee never bothered you in the first place. Outdoor stairlifts will for sure make your life a lot easier. If you’re concerned about cost, you can look into some reconditioned stairlifts. They are lower in cost than new stairlifts. Just because they are cheaper in price, does not mean they are cheaper in quality. Do your homework about where you’re buying your lift, but note that the good companies will give you the same quality and warranty standards for a reconditioned lift. Overall, if you’re having trouble with your indoor or outdoor stairs, don’t dwell on it or move away from your home that you love. 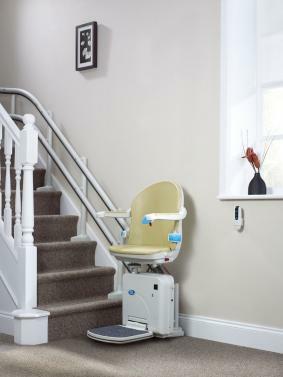 The convenience of getting around your house using a stairlift is so much better than uprooting your life to move to a house with no stairs. You will be so much happier staying in your own place and using your lift to get up and down.